A new network of Elonex Digital 48 Sheet screens was launched in Birmingham City Centre this week. The three new screens are all located at high footfall visitor areas in the city, and went live to coincide with the opening of Birmingham’s world famous Frankfurt Christmas Market. Designed and manufactured by Elonex, the screens have been installed to create a powerful seasonal advertising platform for local brands, and a stunning digital backdrop to the city’s festive celebrations. With the three screens now live, it’s the first time Birmingham City Centre has accommodated a network of large-format Digital Out of Home advertising screens. Positioned at the heart of Birmingham City Centre, the screens feature HDR technology and will target mass seasonal audiences visiting the city’s main retail districts and Christmas attractions, including the Frankfurt Christmas Market and Festive Big Wheel and Ice Rink. Content to be broadcast on the digital screens will include vital visitor information, wayfinding messaging and Christmas advertisements from Birmingham-based retailers, businesses and charities. This is the fourth consecutive year Elonex has installed digital screens in Birmingham City Centre to broadcast over the vital Christmas trading period. 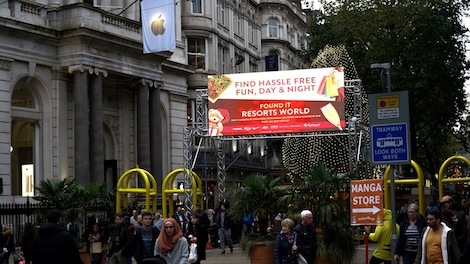 The precise locations of the screens are Victoria Square, New Street and High Street. Each of which is a key visitor destination in Birmingham City Centre at Christmas. Local businesses interested in advertising on the screens in Birmingham City Centre over Christmas are being invited to telephone Elonex on 0121 270 8550 or email astockton@elonex.com. This entry was posted on Thursday, November 16th, 2017 at 15:23 @682 and is filed under DailyDOOH Update. You can follow any responses to this entry through the RSS 2.0 feed. You can leave a response, or trackback from your own site.